We have done it. We have added a third dog to the farm. Her name is Jazmine. 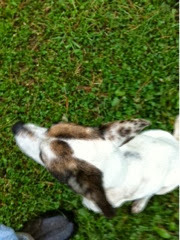 Our oldest dog, Sandi, is slowing down. Sandi is a sweet dog for us, and she worships Homer. But will bite anyone who tries to touch her. She does not want to sleep in our bed, totally housebroken, does not go through the trash, eats a tiny amount: she really is a low maintenance dog. Our big dog, Chaz, has been a great addition to the farm. This one was located via an ad on craigslist. We gave a couple chickens and a dozen eggs for her. I picked her up and then went to the drive through at the bank. They sent a milk bone out with the receipt, and Jazmine ate it like a starving dog. We crossed the street, got a can of dog food. She ate it in no time. Big bowl of water. Skinny. Quiet. Met both dogs and had no issues. Took a couple long walk/runs around the place, hung out with us while the days work was completed, never sat down. Moving, sniffing, looking for mice. Sandi still growls and snaps at Chaz when he goes near her. He wants a dog to play and run with, and did so with Jazmine. Until Jazmine got on the scent of a mouse, and got to work. Work that Sandi used to do, but as she rounds the corner on her 12th birthday, only does a little. We decided she needed a wing dog. Listed as a Jack Russell mix, Homer thinks Jazmine is part hyena. It's the markings. Anyone can pet her. She does not jump up, charge, bark, snap or react in any way. Tail wagging, happy smile on her face. About 5 years old. Probably weighs in at about 10 pounds and needs a few more. Without geese, we are now a dog family. For watching when we can't.